Two weeks ago, I learned that Limelight Impressions has designed a Keep Calm meme t-shirt for Pearl Jam lead singer Eddie Vedder. Having a slight obsession with the band and Eddie since 1991-2, I HAD to have the t-shirt 'Keep Calm and put Some Vedder On'. I had the rare spare $20 to spend, and a portion of the proceeds went to a worthy charity! 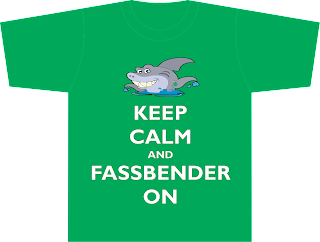 A few days later, I emailed the president, Kelly, and told him about Fassinating Fassbender and presented to him my ideas for Keep Calm themed shirts for our fandom. Over the course of a few emails, we came to an agreement, I submitted text ideas as well as ideas about the use of a 'clover' and a cute 'shark', and voila! We have a Fassinating Fassbender section at Limelight Impressions for you to buy a variety of shirts in different sizes, color, Ladies, Men's, and youth, with different text and characters. The shirt above is what I'm ordering and I cannot wait to wear it proudly. On the back of the t-shirt, up near the neckline is the blog's url - fassinatingfassbender.com. While there are a few adjustments that will be made, along with the addition of another t-shirt design, these bad boys are on sale, now! I can attest with complete honesty to the quality of the t-shirt. I received my blue Vedder shirt a couple weeks ago and I have since worn it twice. I usually wear a small, but I ordered a medium, and it gives me a bit more breathing space. The cotton shirt is very sturdy and of high quality. The color of the shirt is rich, and the decaling of the text and design is clear and perfect. It is a high quality and very well designed shirt. Nothing cheap about it at all. You can buy one, but I reckon that some of you with deep pockets, and a sweet obsession with Fassy, will want to buy several, in different colors, and different designs. It's all good! Go to Limelight Impressions, click on Products, select Fassinating Fassbender, and then Ladies, Men's, or Youth. I purchased the 'Keep Calm when you see a Shark' shirt. Perhaps I'll create a Pinterest page for people to show off wearing their KC Fassy shirts. I think that would be nice to see. I'm the only one who has troubles with pay pal on Limelight?? I want to buy a V-neck but pay pal wouldn't let me. I've been trying it for a week now. But I will fassbender on so keep calm :) I will succeed! Why haven't you mentioned this earlier Hupsakeek, this could have been brought to the admin's attention. Also, can you a credit card instead? Yeah credit card is an option. I didn't mentioned earlier because I thought the problem was on my side, but now I know it isn't. When I select the paypal button it give the following txt: PayPal gateway has rejected request. Billing address request is not enabled for merchant. It's something what occurs often so on the www are solutions to this problem and i.m.o it's something that the seller has to change. I brought this to Kelly's attention and he's working with paypal to get it fixed. In the meantime, if you care to use your credit card, that's an option.